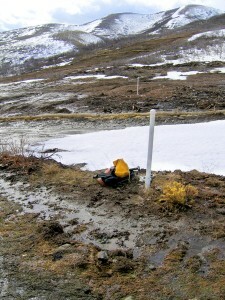 The relationship between ground-water levels and late winter/early spring snowmelt was evaluated at selected northern Utah landslides where ground-water observation wells had previously been installed. The period of investigation between September 2007 and August 2008 was characterized by generally wetter-than-normal conditions in the fall and early winter and subsequent drier-than-normal conditions. Snowfall in early winter resulted in a sustained snowpack that lasted through early 2008 at low elevation and into the spring at higher elevation. Ground-water levels predictably rose with melting snow, but the proportion of the rise attributable to melting of the winter snowpack varied. Peak ground-water levels consistently followed the onset of snowmelt, and locally occurred subsequent to local snowmelt around the vicinity of the observation well. At some locations, high ground-water levels were sustained for weeks or longer despite dry conditions in the spring and early summer.